"With an eye on your health," Melinda Whiteman and the Henderson County Rural Health Center Board have selected a new name for their growing health care facilities: "Eagle View Community Health System." The Henderson County Rural Health Center has undergone many changes in the past year, including the construction of a new clinic in McDonough County and a new pharmacy in Oquawka. With the organization expanding beyond Henderson County, staff and board members have decided to change the Center's name to Eagle View Community Health System. "This change reflects the paradigm shift in the perspective of our staff and board members," said Melinda Whiteman, executive director of Eagle View Health Community Health System. "We have expanded our focus to include the healthcare needs of residents throughout the Mississippi valley, not just one county." Staff and board members unveiled the name and a logo at a December 6 press conference at the organization's headquarters in Oquawka. The new logo features the face of an eagle, along with the tagline "With an Eye on Your Health." "Our new logo captures the essence of our mission," Whiteman noted. "We want to proactively focus on preventative care, helping those we serve see the bigger picture of how to preserve health and wellness, not just fix problems. 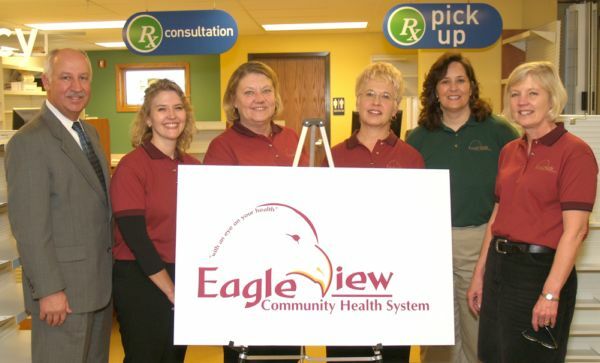 Eagle View Community Health Systems hopes to accomplish this mission through its clinics in Oquawka and Stronghurst, as well as an Oquawka pharmacy and a clinic in Macomb, both of which are scheduled to open early in 2008. A new web site, eagleviewhealth.org, will be launched soon. "We are excited about future growth and expansion, but we have not forgotten our roots," Whiteman said. "Oquawka is still our headquarters, and we are proud to call Henderson County home. We will continue serving our friends and neighbors there with quality healthcare." Whiteman also thanked area individuals and organizations that have contributed time and resources to assist with the ongoing expansion. "None of these changes would have been possible without assistance from caring members of the community," Whiteman said. "We owe a debt of gratitude to those who have supported us throughout the expansion process." The Eagle View Community Health System, Inc., is a not-for-profit provider of community health care services (medical and dental), with the primary location and administrative offices in Oquawka. Eagle View has operated a clinic in Oquawka since 1979, and a clinic in Stronghurst, since 2000. A third clinic, located in Macomb, is scheduled to open early in 2008. All three clinic locations offer or will offer both dental and medical care for everyone. The Brent Family Healthmart Pharmacy will be opening up in Eagle View in Oquawka January 2, 2008. Eagle View is funded by revenues generated from services rendered, as well as a federal grant and local fundraising and state funds for particular projects, such as Oquawka Pharmacy and the McDonough County Dental Clinic. Board members of Henderson County Rural Health Center gather for a special ceremony Thursday to indoctrinate the official name change of their growing facility. From left is State Representative Rich Myers, Mary Jane Clark (McDonough Co.), Karen Cole, Coral Seitz (Chairman of the Board), Melinda Whiteman (Executive Director) and Ellie Zoerink (McDonough Co.).